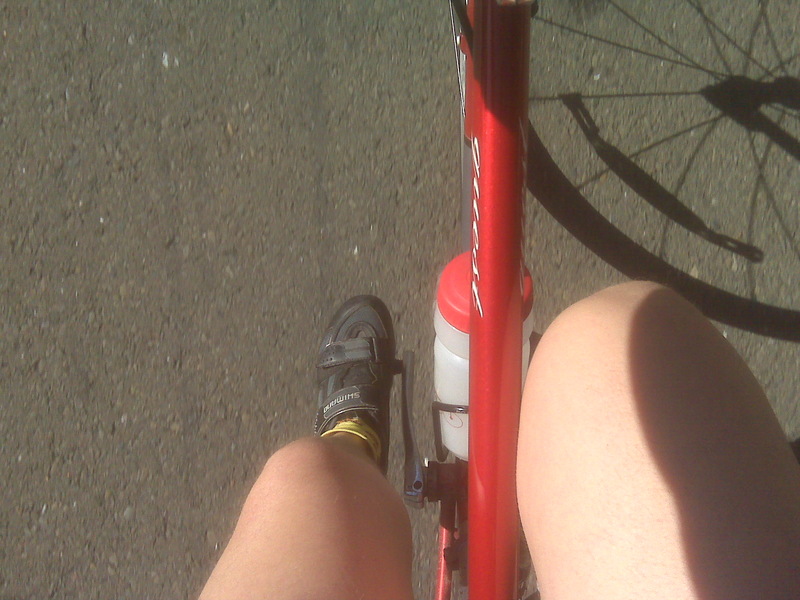 An attempt to get a photo of legs while biking. That’s not something I would have said 15 years ago. Or even probably 5 years ago. But I’m still trying to come to grips with what happened at the Boston Marathon. As a woman – heck, even as a girl – growing up in the good ole suburban USA, I hated my legs. I thought I was fat, even when I would lose my menstrual cycles every fall during swim season (which is a sign that one does not have enough body fat to bear a child). I knew I wasn’t skinny, which would have been find had there not been plenty of feedback around me to suggest that I should be. And my legs were the worst part. I also know I wasn’t the only one. I remember a rowing teammate – on Radcliffe Crew, a pretty high-level program – talking about how she got through an erg test. “I just looked down at my thighs and said ‘I hate you! I hate you!’ on every stroke.” This was a top athlete (I was a walk-on, she was a recruit) whose thighs were keeping her in the first boat while I struggled to hold my seat in the third. Seriously? Those thighs could get you a gold medal if you work hard enough. Mine, not so much. But my legs let me do lots of things I love. I may not be a competitive athlete but I am a sports freak, and I’ve never let finish times keep me from pursuing the activities I love. Which include biking, hiking, skiing, swimming, and running. With the exception of swimming, all of those are much harder to do without legs. So since I read reports of people losing limbs from the bombings, I’ve been trying to make amends for decades of hating on my legs. I know that there are many ways to live a meaningful life. I also want to appreciate the abilities that I have and the limbs that function so well to let me do the things I love. I have a couple of training rides to report on still, but I’m just kind of caught up in this stuff right now. Hopefully tomorrow night I can catch up and tell you about seeing the cutest puppy ever last Sunday, and my up-too-early misadventures from today. But for now, I’m going to go stretch my legs, and give them a hug. ← So sad. So inspired.